The Melbourne Disability Institute and the Brotherhood of St Laurence are co-funding a research project on the different housing pathways available for people with disability. The project aims to provide practical resources for individuals and communities to build pathways to access and maintain housing for National Disability Insurance Scheme (NDIS) participants by promoting existing options and encouraging the transfer of proven models around Australia. The project is framed around seven interconnected housing segments; new Specialist Disability Accommodation (SDA), existing SDA, non-SDA supported accommodation, social housing, private rental, in own home and in family home. The project will focus mostly on those not in or eligible for Specialist Disability Accommodation, “the other 94%” on the basis there is money and skilled operators in the SDA space already. Develop and pilot a community-based methodology to support community understanding and action to house the NDIS participants in their community. The information and tools produced during the seven month project will be disseminated through an online platform open to people with disability, service providers and Local Area Coordinators to respond to the increasing need for accessible housing. The project aims to provide information that will help people with disability find housing. If you have a housing-related question you would like answered, submit it here and we will do our best to address it through this project. 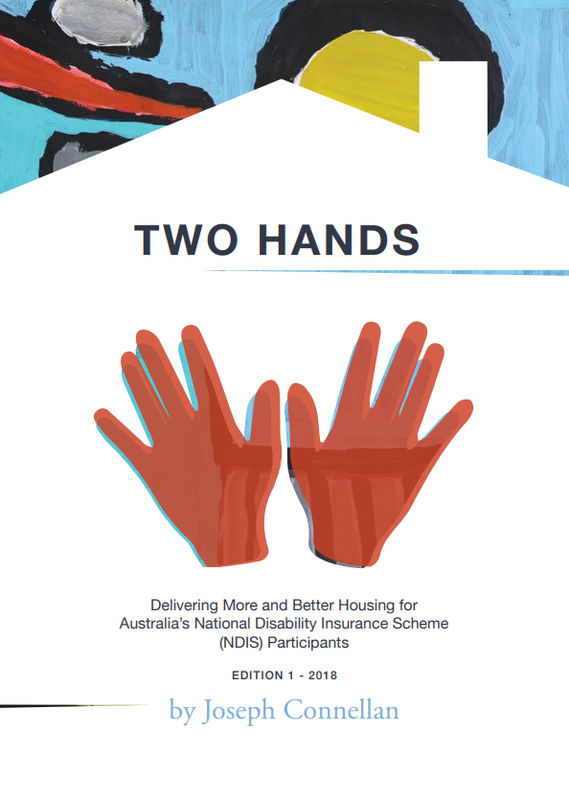 This book provides information about the National Disability Insurance Scheme (NDIS) and its development, details of current supply and the proposed Specialist Disability Accommodation (SDA) policies. It explores funding and growth opportunities and presents a framework to support the analysis of any housing project for people with a disability. Finally, it looks at the implications of some key policy directions, such as separation of housing and support and choice of provider. The NDIS Housing Pathways Project is proudly supported by the Brotherhood of St Laurence. Do you have a question about non-SDA disability housing? Tell us what it is and we will do our best to answer it as part of this project. What are the barriers to accessing and maintaining housing for NDIS participants? What types of housing are available for people with a disability? What affordability benchmarks are used in housing? Can SDA recipients own their own SDA? What options are available for a young person living in residential aged care? What new governance models for group homes are out there? How have group homes changed? Are people who get SDA allowed to claim Commonwealth Rent Assistance and how is it determined? How will the NDIS impact people living in Supported Residential Services (SRS)? Will they be able to access alternative options? Why do social housing landlords require NDIS participants to have supports before considering their application? Is this requirement discrimination? Who can I appoint as manager for the house (which we own) in which our son lives, who is not eligible for Specialist Disability Accommodation (SDA)? What is the MDI NDIS Housing Pathways Project? This page lists a number of links to websites which we think may contain helpful information. Please note this page is still under construction and will be added to over time. 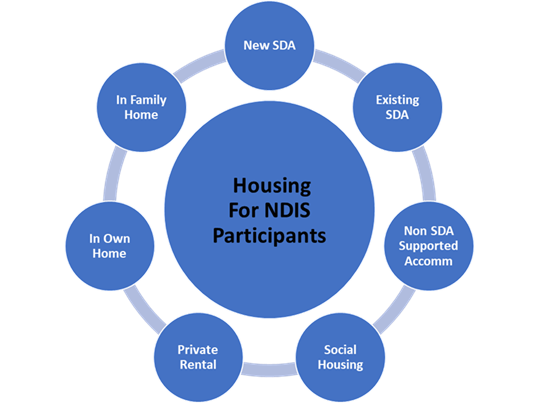 Information provided by the National Disability Insurance Agency on housing for NDIS participants. Belonging Matters has a series of free resources focusing on Home and Accommodation. This report by the Housing Innovation Bank project aims to identify best innovative practice in the housing and support for participants, including people eligible for the Specialist Disability Accommodation (SDA) funds, within the National Disability Insurance Scheme; and understand what are the key elements that would enable the replication of the innovation in Australia to be sustainable and to reliably lead to early, positive and enduring outcomes for people with disability. Disability Database is a free, Australia-wide disability housing classifieds which connects people with a disability (and their families and Support Coordinators) to vacant rooms offered by different disability accommodation service providers across Australia. It's free to use and no payments are made through the website. Simply browse available rooms and make enquires about suitable homes. These links are current and live to the best of our knowledge. If any of these links are broken or do not work, please let us know and we will fix it. This page is still very much under construction and more content will be added here over time. We welcome your input; if you know of other useful information which is not yet listed here, please let us know. Joseph is in the early stages of shaping the project and is interested in hearing from the community on the effective housing pathways which are currently being used and have the potential to be implemented more widely. “If you have any suggestions, ideas or simply wish to keep in touch with the project, please contact me.” says Joseph.